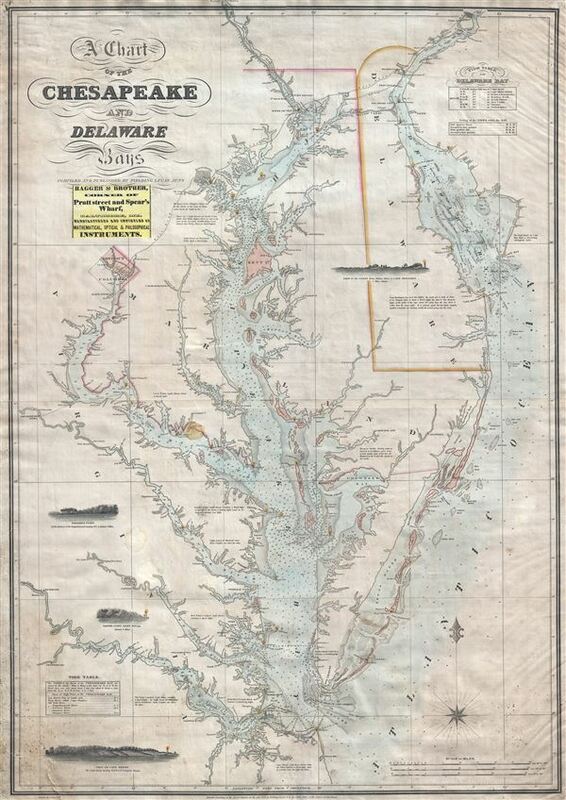 The only significant map of the Chesapeake Bay to be issued between the early 19th century Admiralty Charts and the Coast Survey Charts of the 1860s. A scarce, important, and highly desirable 1852 nautical chart or maritime map of the Chesapeake and Delaware Bays by Fielding Lucas Jr. This chart covers the entirety of the Chesapeake Bay from Wrightsville (on the Susquehanna River) and Philadelphia (on the Delaware River) to Cape Henry and Norfolk, Virginia. The chart illustrates inland navigation on the rivers as far upstream as Philadelphia, Port Deposit, Baltimore, Washington, and for considerable distances up the Rappahannock, York and James Rivers. Soundings extend to the numerous large rivers emptying into the Bay. The entrances to both the Chesapeake and Delaware Bayws depict shoals and other dangers. There are four profile views illustrating the coast: The Indian River to Cape Henlopen, Windmill Point, Smith's Point Light House, and Cape Henry. The present example also bears the paste down label of Hagger and Brother, the leading purveyors of Nautical and Scientific Instruments in Baltimore in the early 1850s and, apparently, the exclusive purveyor of Lucas' chart after about 1830. This is Fielding Lucas's only published nautical chart - although he did publish other land based maps. Lucas himself was the only Maryland based chartmaker active in the first half of the 19th century and prepared this chart to fill gaping hole in the maritime mapping of the Chesapeake Bay region - between comparatively inaccurate early British Admiralty charts and the planed, but as yet to be realized, work of the U.S. Coast Survey. In fact some of the cartography as well as the four views are drawn directly from Anthony De Mayne's 1814 British Admiralty Survey of the Chesapeake. Lucas first published this map in 1829 with regular updates until the early 1860s - when this chart was superseded by superior Coast Survey material. The map exhibits overall fine engraving and refined craftsmanship and throughout offers impressive attention to detail and accuracy. Lucas' greatest innovation is the incorporation of color - uncommon in nautical charts and a convention that was not embraced by subsequent publishers. The present example bears a copyright date at bottom center of 1852. It was engraved by John and William w. Warr of Philadelphia. The whole is presented on a Mercator projection. Most early examples of this map do not bear a seller's stamp. This changes around 1832, when the Haggar and Brother pastedown is added to most examples just under the title. Haggar and Brother were prominent sellers of nautical charts and instruments based in Baltimore. The firm was established in 1784 and flourished well into the 19th century. It is likely that Haggar and Brother acquired the plates and rights to this map around 1832 as it continued to be updated and republished for several years after Lucas' death. Very good condition. Some repairs lower left corner. Soiling including spot near Medley's Neck. Original linen backing with stamps and owner's signature. Rumsey 5436.000 (1840 edition). Foster, J. W., Fielding Lucas, Jr., Early 19th Century American Publisher of Fine Books and Maps, 'American Antiquarian Society', October 1955, Volume 64, Part 2, 162-212. Guthorn, Peter J., United States Coastal Charts, p. 78 (illus. on dust jacket). Papenfuse, E. C., and Coale, J. M., Atlas of Historical Maps of Maryland, p. 86 and fig.78. Ristow, W., American Maps and Mapmakers, pp. 266-268.